Last night, I was so bushed I just wanted to drift off to sleep fast. But I couldn�t. Wong Kar-Wai on dvd was calling me, luring me once more to watch his poetry on film. 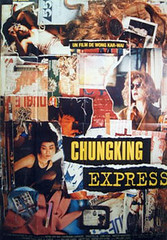 Thanks to Jem who bought me an original dvd copy of Chungking Express (I so love you Jemmy!). I�ve been wanting to have a copy of this movie since seeing it twice back in college. And so, eyes half closed, Ederic and I watched as Takeshi Kaneshiro�s He Qiu-Wu pined for his ex-girlfriend while ingesting thirty expired cans of pineapple. Can�t really choose what scene I loved best: Qiu Wu jogging to get water out of his system so there would be nothing left for tears (panalo sa kakornihan to! ), the cop played by Tony Leung talking to a piece of worn-out rag, Faye (Faye Wong) head banging to the music of Beach Boys (California dreamin…. ), the Chinese version of the Cranberries� Dreams blasting from the cd player, the cop catching Faye red handed. So much interesting stuff goes on in the film all the while injecting great humor, soundtrack, editing, cinematography. The script is poetry at its best. I think I was smiling all throughout the movie. There is something about Wong Kar-Wai�s films that make you feel sentimental about time passing by, strangers you may never get to meet, people you might have loved, the past you will never recover. That is the poetry of Wong Kar-Wai. actually, talagang malala ang fixation ni kar-wai sa konsepto ng panahon. 2046, for example, is oft described as kasabay na pag-usad at paglingon. not to mention, ang galing ng cinematographer niyang si christopher doyle. para talaga tula ang mga pelikula niya. Throbbing may well be the perfect word to describe Wong Kar-wai’s frenetic universe. Lights flash, cars zoom, pedestrians bolt. And tearing through the rush of his world is a populace on a frantic search for gravitational pull. In their haste, they fall in love with all the wrong people, though this very contemporary romantic usually allows us to believe it’s for all the right reasons. mukhang maganda yan.may mabibili ba nyan. IRIS: Ay su! Alam na alam ko kung bakit fixated ka sa mga pelikula ni WKW. 😆 Sabi ko na nga ba at ikaw ang unang magko-comment dito. labs ko din wong kar wai. at si faye wong. kaka inggit ka naman original dvd ng chungking. ako pirated lang. hehe. mhay pahiram ng chungking express!!! di ako makatyempo sa makati cinema square nyan eh. mhay, ako rin gusto ko ng copy ng Chungking Express (tama ba spelling ko). last night nga, i watched Tokyo Godfathers sa Animax, ang ganda. story of redemption, about three bums na na-reunite sa kanilang families through one baby na iniwan sa may basurahan one lonely Christmas night. grabe, ang galing talaga ng Asian cinema, anime and everything. sana makapag-sked tayo ng weekly or bi-monthly na home-movie date, pwede sa inyo or sa bahay ng isa sa atin. parang get-together. di ba ok yun?